Landing airplanes on top of buildings was a really common theme in articles of this time. It’s kind of boggling that anyone thought it could be done safely. A NEW YORKER has invented a novel turntable runway which he believes will be suitable for landing and take-off of airplanes from the tops of high buildings. The device is declared to offer many advantages over the proposed platforms for such landings. The landing table can be tilted at any angle and swung about in any direction so that the wind is along its axis. The incline naturally serves as a brake on the landing ship and air blasts assist in checking the speed of the landed ship. The turntable would also present an incline which would enable a faster than ordinary take off. That looks crazy dangerous, even for the ’30s: risk of overshoot, side gusts, stalling, etc. all in an urban environment. Even if it worked, what happens then? The plane stays there so no one else can land? What happens when they get a windstorm and that thing shears off and goes tumbling through the city? Two words – rejected takeoff. Push it off the side of the building. That air blast scheme to produce intentional low-level wind shear seems profoundly stupid. It would add lift just as the plane is about to touch down. True, the blowing air would tend to slow the plane down relative to the runway, but it would increase airspeed, and produce more lift. The added lift would take weight off the landing gear, reducing braking effectiveness. For a short field, it’s good to quickly get as much weight onto the wheels as possible so that the brakes can be used right away. The fact that this didn’t get built is reassuring. Sure, there were crazy ideas back in the day, but at least the barriers to actually getting things built were a bit higher than the barriers to getting published. If the airline industry was having these kind of ideas in the 30s no wonder train travel was so popular! Dirver, take me to Union Station! 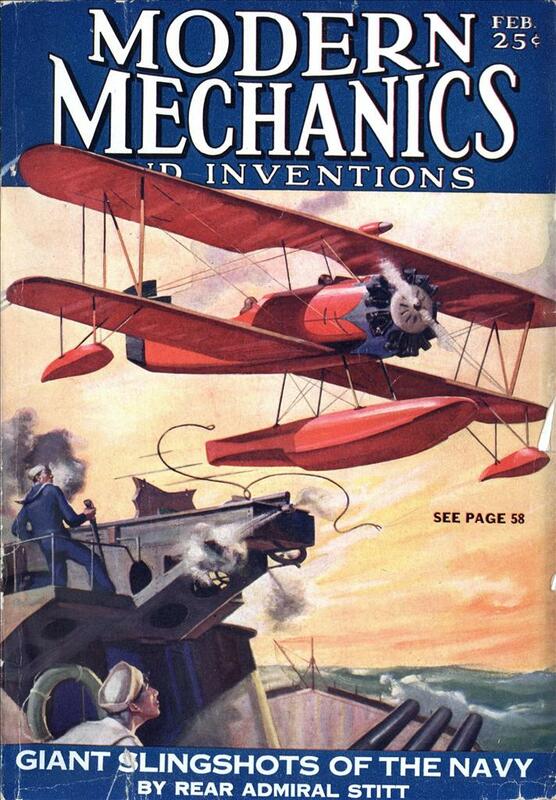 I don’t think the airline industry was the impetus for these ideas, but flying was crazy dangerous at the time. Even in the Fifties air crashes were common place – a dozen or so per year in the US alone. I see a Wile E.Coyote moment coming. Harry Holt had a habit of coming up with his inventions during the cocktail hour. I can see this is one of his wonders. Devak: Who was Harry Holt? In the end, it turned out to be easier to just invent the helicopter. Were there any ideals wild enough to be denied publication?? OK. Let’s put aside takeoffs and landings and wind shear. HOW THE #%@%@ DO THE PASSENGERS GET OFF?! Down a ladder? In the rain? Horizontal at that height! Sleet? When I fell down the steps of our train station once, I was … freaking mental … about that. Slip and fall getting out of the plane? Baggage unloading? I wonder how some tourist’s Brownie does when it falls out of his case and smashes 80 stories down? 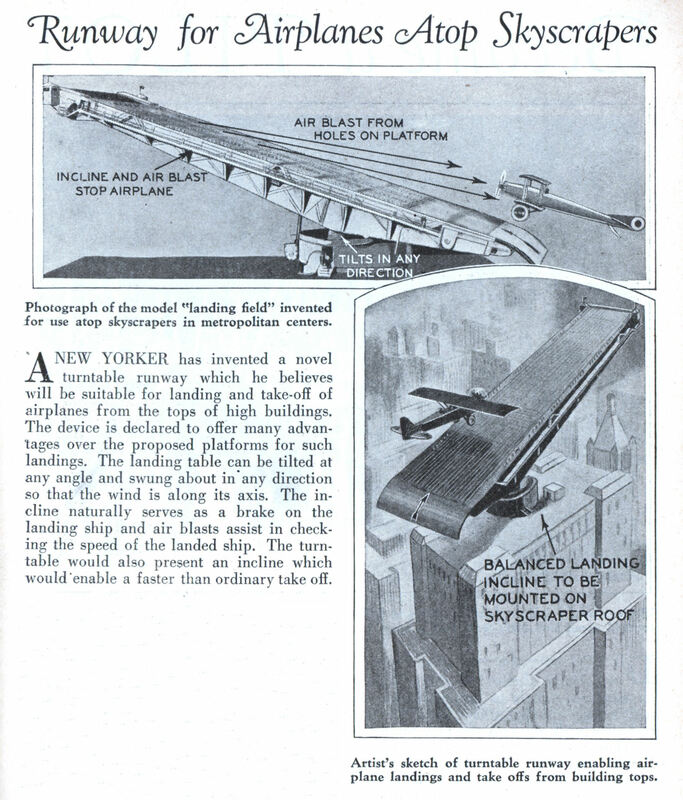 The dirigible mooring point at the Empire State Building, I’d read, wasn’t intended as a serious proposal. I hope. Yuck! Fancy having to land on such a contraption. Reminds me of some of the so-called “altiports”. Google for Lukla (Tenzing Hillary Airport, Nepal), Courchevel or Megève (both Frankreich). Although, I think they were dead serious about the Empire State airship mooring. They were just lucky to run out of suitable airships. To the best of my knowledge, the only civillian dirigible in service at the time was LZ-127 Graf Zeppelin. R101 having crashed in 1930, R100 having been condemned and slated for demolition in 1931, and the ZR-3 Los Angeles being US Navy.